Mulled wine or glögg looks especially festive in in glass teacups. Photo by Y.M. Naama | SXC. CAITLIN BARRETT is on the editorial staff of THE NIBBLE. Her mulled wine secret ingredient is extra brandy. This is Page 2 of a three-page recipe article. Click on the black links below to visit other pages. Glögg is the Scandinavian form of mulled wine, sweetened with sugar and spiced with bitter orange peel, cardamom, cinnamon sticks, citrus, cloves, ginger, vanilla pods, and often, almonds and raisins. 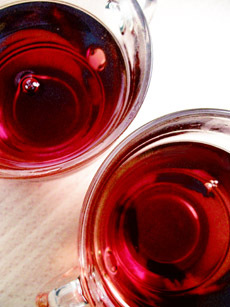 A non-alcoholic version can be made with grape juice or non-alcoholic wine. While aquavit and vodka are the spirits of choice, brandy can be substituted. Greet your winter guests the Scandinavian way: with a steaming cup of this delicious cold-weather beverage. Adding the almonds and raisins turns the mulled wine into the Scandinavian version, glögg. The combination of dry wine and vodka with the flavor-forward spices and the brightness of citrus zest packs a punch that could make anyone forget just how cold it is outside. 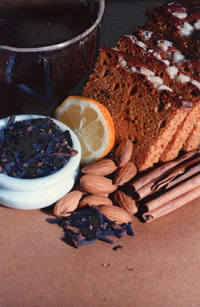 Enjoy your glögg with gingerbread, almonds and an orange slice. Photo by Esther Ruzé | SXC. In a large saucepan or stockpot combine the wine, vodka, mulling spices, orange zest and sugar. On medium heat, allow the mixture to come to a temperature just under a simmer (never let it come to a full boil), and cook for at least 30 minutes. Discard the mulling spices. Drop a few raisins and almonds at the bottom of each mug and top with the hot liquid. Serve warm...with gingerbread! Glögg (pronounced glugg) can be made in a large batch and reheated over and over, as long as it is never allowed to come to a boil. If you buy mulling spices premixed, it’s more expensive but you’ll always have them at your fingertips when the mood (or need!) strikes for that cup of good cheer. It takes time out of mixing up your festive brew. The spices and percentage of the blend they comprise in any particular brand of mulling spice will vary, so if one brand isn’t your particular “cup of cheer,” try another. If you can’t find mulling spices at your supermarket or specialty food store, check out Victoria Gourmet’s Mulling Spices. This is the only blend we’ve seen that includes star anise along with the cinnamon, cloves, allspice and orange peel. Be sure to look for blends at farmers markets and apple orchards, too. 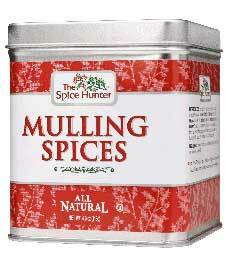 Although it’s easy to mix your own, you can buy pre-blended mulling spices for home or to give as a gift. Photo courtesy The Spice Hunter.